You must be a member of the Duesseldorf Last Minute Activities Group to attend this activity. Would you like to join this group? A Sunday afternoon movie about Samurais by Kurosawa that has 8.1 on IMDB and is for free. Who's in? 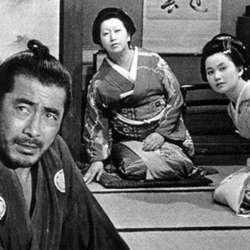 Let's watch the fabulous Akira Kurosawa's masterpiece 'Sanjuro' at the Japanese film festival in Düsseldorf. It shows in Japnese with sub titles; German or English. The movie entry is for free. The film starts at 11:30 a.m. but we need to be there an hour Early to get tickets. The early bird catches the worm, so let's get there at 10:15 and get those tickets. Post the film, we can get a coffee in town! We will wait outside for about 10 minutes depending on how long the line is. Am hoping that there are not many takers for an early Sunday morning film. Worst case, no tickets and we get a coffee!